Cold War and colonial-era stereotypes have hindered the development of political and economic ties between Russia and Africa, but that could be changing. Minimal efforts to promote import-export opportunities and inadequate knowledge of current market changes are key factors affecting economic cooperation between Russia and African countries, but experts have repeatedly suggested that this trend can be reversed if both African governments and Russian authorities combine serious dialogue with a concrete business agenda. But despite Russia’s lack of interest compared to China, Mhlongo suggested that Africa needs to engage all BRICS members equally with the goal of building alliances and opening trade, finance and investment opportunities. Mhlongo suspects that many African countries are still holding on to old ideas about Russia being less technologically developed and unsophisticated compared to Western Europe. Mholongo suggested one way Africa and Russia can begin a dialogue on trade is to initiate an Africa-Russia summit to explore economic opportunities. A similar meeting has actually already occurred. Last December, the first Russia-Africa business forum took place in Addis Ababa, Ethiopia under the chairmanship of Ethiopian President Meles Zenawi. The forum that aimed to review the business relations between Africa and Russia and identify potential spheres for strengthening bilateral economic cooperation. The forum was initiated by the governments of Russia and Ethiopia, and the non-profit New African Initiative (NAI). The main organizers were Gazprombank, the Russian Chamber of Commerce and Industry, and the coordinating committee for economic cooperation with sub-Saharan African countries. According to the Russian Foreign Ministry, the African delegation to the forum included Teodoro Obiang, president of Equatorial Guinea; chairman of the African Union Nguema Mbasogo; and chairman of the Commission of the African Union, Jean Ping, as well as many African ambassadors. On the Russian side was Special Presidential Representative for Cooperation with African countries Mikhail Margelov and a number of other high-level officials along with representatives of 30 major Russian companies. 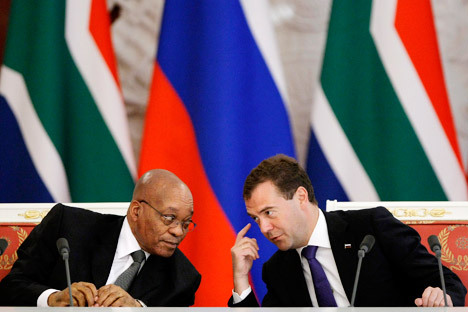 Despite what some African leaders might believer, Margelov said that Russian companies are highly interested in the development of natural resources deposits in Africa. Russian companies want to develop deposits of rare metals, including cobalt and chromium ores, and uranium fields. The companies are also interested in diamond and platinum metals production in African states. "Africa is a prospective region for Russian mining companies and Russia can offer technological products in the military, geological exploration and energy spheres. There are also prospects for sales of our metallurgical and machine-building products in Africa," Margelov said at the forum. "Russia's participation in oil and gas production is important as well since Africa will provide up to one quarter of the world's oil output soon," he said, adding that Russia faced competition with U.S., EU, Chinese and Indian companies as well as with corporations from the Arabian Peninsula in the region. "We must use our competitive advantages, as we excel competitors under quality-price ratio in some industries. We still have knowledge of prospecting, production and transportation of natural resources, while in the political sphere we are neutral compared with the cold war period," Margelov added. Dr. Xiao Yuhua, Research fellow, Institute of African Studies, Zhejiang Normal University, China, and Visiting Scholar, Addis Ababa University, Ethiopia, said that the rapidly rising portfolio of China in Africa's economy and the strengthening relations between China and most African countries have inspired alternative development partners and paths for African governments and the African business community. According to him, the trade volume between China and Africa reached $160 billion in 2011, but China's accumulated investment in Africa was around $400 billion during the same period. At the same time, Africa has become China's second-largest oil supplier, the second-largest market for China's engineering contracting and the fourth-largest destination for China's outbound investment. Fyodor Lukyanov, Editor-in-Chief of the Russia in Global Affairs journal said that the Chinese strategy in Africa is about getting access to resources that are vitally important for Chinese development. "Russia has not similar need to gain African resources, so there is no motivation to develop such a comprehensive approach. We can identify many aspects of Chinese experience which would be useful to learn, but looking realistically I don’t think Russia will ever do it," Lukyanov said. Catherine Grant, Program Head Economic Diplomacy at the South African Institute for International Affairs (SAIIA) identified other challenges: "There are additional challenges with regards to Russia, such as the language and an unfamiliarity with the culture. And, I think it is not so much that Russia is perceived as not open for business but traders are unsure of how to get into the Russian market." Grant suggested that Russia consider offering preferential market access to products from African countries, as has been done by China and other trading partners. It would be mutually beneficial if the preferences were given on products that Russia does not produce itself since reduced tariffs would bring down the costs for Russian consumers. As far back in June 2009, Namibian President Hifikepunye Pohamba suggested that Russian President Dmitry Medvedev should consider opening Russia's market for African produce and services, but this proposal has still not been raised for serious discussion in Moscow. James Shikwati, founder/director of Inter Region Economic Network (IREN) and CEO of The African Executive Magazine in Nairobi, Kenya, believes that Africans, given a well planned marketing strategy on the part of Russia, would choose Russian manufactured equipment, but Russian companies must do their homework before introducing their products in African markets. Even the UN would like to see stronger business ties between Russia and Africa. "We want our friends, including from Russia, to come to Africa to do business to create wealth and jobs for the people," said Kandeh Yumkella, the Director-General of the UN Industrial Development Organization (UNIDO), in a video address to participants attending a conference on relations between Russia and Africa in Moscow. "This is about a new business relationship and a new business model of partnership, a win-win situation with both sides benefiting," Yumkella told the delegates. He said Africa was in need of partners ready to help the continent create wealth. "I want to say to my African brothers and sisters: Don't come to Russia asking for aid, come to Russia to ask Russia to do business with you. Aid alone cannot change any nation. It is determination, competitiveness and technology transfer that can bring the necessary changes," Yumkella said. Yumkella added that many African doctors, engineers and other professionals had in the past benefited from training in Russia and noted that he was glad to see Moscow working to strengthen that partnership again after almost two decades. He, however, cautioned that for business to come to Africa, countries in the continent needed "good governance, clear, transparent political systems, and good policies so that investments will be safe."